The hubster made a comment recently that made me laugh. Not just laugh but out and out chortle. He said, "You know it seems like things have calmed down for you because you're no longer blogging about the chaos around you." I looked at him with my standard, "You're kidding, right?" expression. Look, it's always a poop storm around these parts. I just opt to focus on the fuzzy parts every now and then. Don't mean I'm not still dodging the poo. One of my New Year's resolutions was to slow down. To talk less. Reflect more. And write with more calmness. But sometimes, it is hard to keep the chaos under control, regardless of how many darn deep breaths I take. Take Sunday for example. Little man and mamma are hanging out. Things are going well. We have read Goodnight Moon 27 times. We have eaten lots of blueberries and not enough pasta. And we are counting down the seconds to nap time so mamma can have the second coffee she so definitely deserves. When little man throws a wrench into the works. So here's the requisite warning. We're about to discuss throw up. On a food blog. If that kinda thing freaks you out, I understand. I also understand you likely don't have kids. But we're about to get real (i.e., gross) up in here so if you need to stop reading, I understand. However, if you're like my friend Amy Kim who wisely coined the phrase, "I've been puked and pooed on. Nothing phases me," then by all means, read on. So when little man threw up on the carpet, my New Year's resolution flew out the window. I said goodbye to my promise to be calmer and went into my default frantic mode. For a few minutes, I was a whirlwind of carpet cleaner, antibacterial wipes, and Febreeze. And hand soap. Lots of hand soap. And all I learned is it's incredibly difficult to get blueberry hued "residue" off of carpet. And I realized that on those days when the carpet smells vaguely like throw up and the laundry is in big piles of dirty and kinda-dirty, the only viable lunch option is Naan Pizza. I know I know, this is not a "real" recipe. It's similar to my Mexican Fried Rice in that regard. It's more a formula that you tweak to fit the ingredients (and time!) you have on hand. I've made Naan Pizza with warm fluffy takeout naans from our favorite Pakistani restaurant. I've made it with the frozen naan we get in giant bags from Costco. And in truly desperate times, I've made it on regular ol' pita bread. I've made naan pizza in the oven, the toaster oven, and on the stove. I've topped it with tandoori chicken, roasted red peppers, scallions, mushrooms, cheddar, mozzarella, and/or pepper jack. It all works. And it is awesome each and every time. Now if you'll excuse me, I have some carpet to clean. And some Naan Pizza to eat. Let us be optimists here and assume you have enough time to make delicious tandoori chicken to top your Naan Pizza. If it's more of a realist kinda day, ditch the tandoori chicken option and top your Naan Pizzas with the frozen meatballs hiding in your freezer. But for optimism's sake, here's how you make your tandoori chicken. Cut chicken into cubes, strips, triangles, or whatever shape strikes your fancy. Add yogurt and all of the spices and mix thoroughly. Marinate your chicken mixture anywhere from 1/2 hour to overnight. Heat 1-2 tablespoons of oil in a pan. Cook chicken in a grill pan on the stove for gorgeous charred chicken. When chicken is almost done, toast your naan in the oven or toaster oven. During the last few minutes of toasting, top with shredded cheese, tandoori chicken, and/or other toppings of your choice. Pop the naans back into the oven until the cheese melts. Devour quickly because you could be called for the baby cleanup brigade any second. Great article with excellent idea! I appreciate your post tandoori chicken naan pizzas. Thanks so much and let keep on sharing your stuffs keep it up. Yuuuummy! 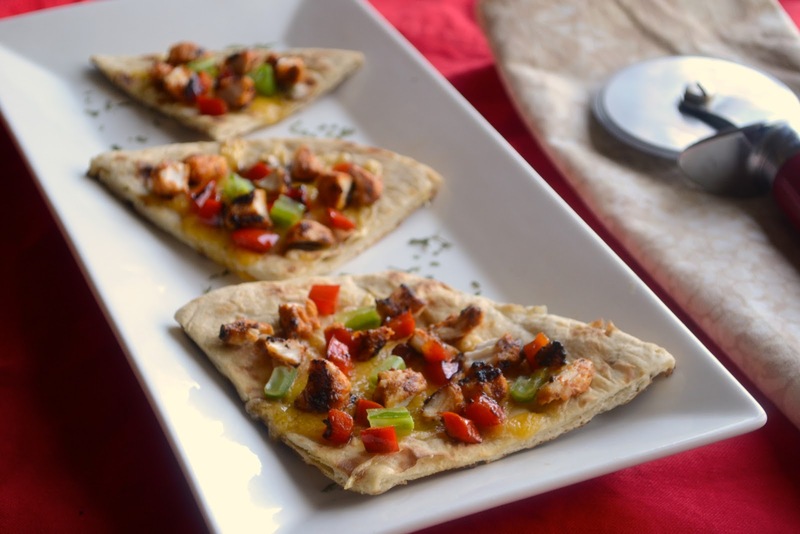 I love making naan pizzas or naanwiches for an easy lunch or dinner. It's so good! I could see doing this with paneer tikka masala, or using pav bhaji as the sauce and topping with paneer as the cheese. Om nom nom. Sorry your little man was sick. I don't have kids and talking about vomit is not my thing, but it wasn't so bad reading it LOL. I think I'd be more squeamish and weirded out if you had video taped it and posted that on your blog. But then I'd be weirded out in general.. While I don't have kids I have dogs. Unlike kids, dogs like to actually eat poo, and then throw it up. So I feel ya, definitely :) I love quick go to meals like that and make them often. Oh sweet friend, I love your thoughts here. Slowing down is so important...and sometimes things like throw up make you slow way down. I caught two stomach bugs after x-mas...and didn't do much at all! But these pizzas look super delicious. Thank you for sharing with me. This post, along with my cup of hot chocolate, is making for a very lovely Thursday morning (despite the throw-up). Have a great weekend! you are so witty- love it. love the idea of this nan pizza never though about and im sure those meatballs in the freezer will work perfectly. Although I dont have kids, but I can def. imagine the chaos when you have frequent cleaning duty calls. hope the little man feels better! The naan pizza looks so good. I've seen it twice this week and I'm feeling the need for pizza coming on. My son is grown now but, I do feel for you!! I worry now just as much as ever b/c he's in the Army now. I just laughed out loud and my husband gave me the "what the heck" look. My niece was over the other day and had to tell me in great detail about the poo blow-out on the carpet her new brother had. Lol. It gets better, I promise. This pizza sounds so good and so does those samosas you brought to Lisa's. Maybe you could bring some to our next get together (hint, hint). Hope you week is going good, at least tomorrow is Friday. Naan pizza is one of my favorite things! It's so easy to make and in my opinion tastes better than the real thing. Love the Indian touch here! I hear you and we've all been there! !The joys of 'parenthood' :) But your Naan Pizza looks like the best thing to indulge in,in a situation like this :) Love the flavors in the chicken and I can see myself enjoying it for my dinner! Very timely...my daughter officially has the stomach bug. Last night was not pretty...poor kid. If there is anything I know (and I don't know much) is that vomit is the worst. Vomit on the carpet is cause for total panic! Fabreeze is a staple around here...that's all I can say. Naan pizza is brilliant! Reminds me a bit of the Tandoori pizza CPK used to carry. Love this! This is such a great idea Azmina! Sounds Yum! Desi style pizza looks uber delicious. You gotta have simple but good recipes like this to get you by - who wants to cook Cordon Bleu every day? We have a bunch of those frozen chicken breasts from Costco in our freezer right now as my husband likes to cook them for snacks or for lunch during the week--I think your tandoori recipe would be right up his alley. Oh! I didn't put the "too many blue berries" together with the throw up part till you mentioned it. Ouch! Yep... I've SO been there. Glad you had this Naan to turn to! Love your resolution to talk less and reflect more. Sage words of advice I need to take in. Yup, I can relate to this post. Although blueberry adds a whole new dimension. Hope the Naan pizza made it all better. I like your resolution. Without trying to remember to slow down, our life gets easily distracted with homework and activities and whole day passes by. 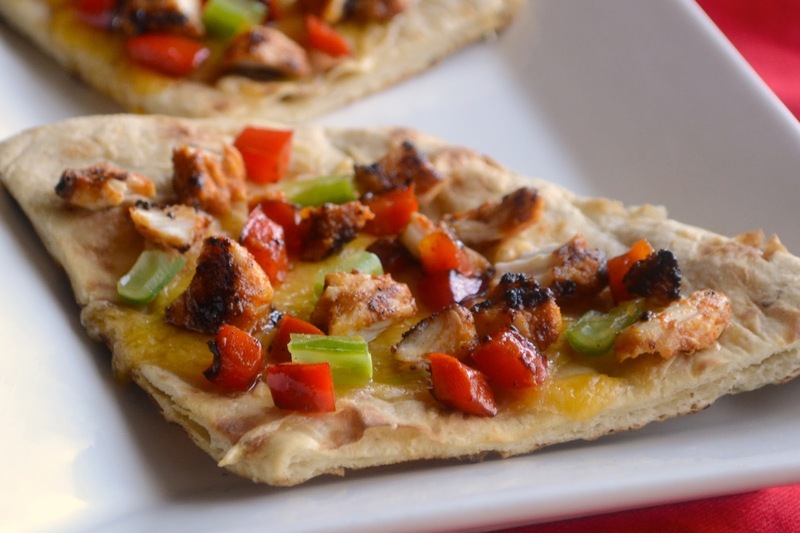 I'm going to make ethis tandoori chicken naan pizza. It's different from typical pizza and we need some changes in our house! Looks delicious! I love naan. Well, all carbs really, so I can totally empathize when it came down to you, a pita, and the need for tandoori pizza. Haha, love it. These looks so great! Healthy too! I've made pizzas with Naan, they turn up so well. The last time I had Tandoori Chicken pizza was in India - Dominos! It was really good. Your version looks so good, and healthy. Man, I give all you women out there who have kids so much credit. I love pizza and this one looks really delish! Thank you for sharing. You poor gal! I would have reacted the exact same way, because nothing throws me into a tizzy than, well, THAT kind of mess. Of course, something good has come of this - I will now use the phrase "poop storm" with alacrity. I think your naan pizza looks delicious! No need to apologize for a yummy dish that's easy to make, and customizable to boot. Here's hoping your next few weeks are calm than the last few! Last year my resolution was to "simplify" I failed miserably. This year to ensure my success I gave up Splenda in my coffee. I can do that, not so good at simplifying(laugh). Your formula for naan pizza rocks. When days are hectic and unpredictable, it is indeed a cooking formula that will help bring the day in for a landing. Everyone needs a go-to easy dinner for crazy days. This looks awesome. I love naan pizza. Yum! Its a wonder you got around to making even naan pizzas on a puke-and-poop day! And hello, who says this is not a legit recipe? It totally is. Just like leftover rice with veggies counts as Pulao. Ha. Wow...this looks delicious! We will definitely be trying this out! This is a beautiful recipe ! This looks so good! Definitely want to try it out sometime. Looks delicious. Perfect for a Friday.